Here are the current 10 best teams in Counter-Strike. With the first quarter of CS:GO competition in 2018 approaching its conclusion, teams around the world are gearing up for the next big international tournament, DreamHack Masters Marseille. To sum up the past couple months of CS:GO, there are two significant storylines: North America beginning to take control from Europe and FaZe Clan sitting on an almost trophyless throne. Other than that, the Brazilians of SK Gaming seem to be struggling, unlike their dominant streak of success in 2017, while the remaining top teams are slowly improving after the post-Boston Major roster shuffle. Here are the current top ten teams in Counter-Strike. This rank set is based on team performances from November 2017 through March 2018 (not counting the ongoing WESG World Finals). FaZe are arguably the best team in the world right now. Even though they haven’t won a championship since the ECS Season Four Finals, which was the last event of 2017, their consistency is unparalleled in the upper echelons of Counter-Strike. Whenever a player performs poorly in a match, someone else on the European all-star team will pick up the slack to compensate and guarantee victory. 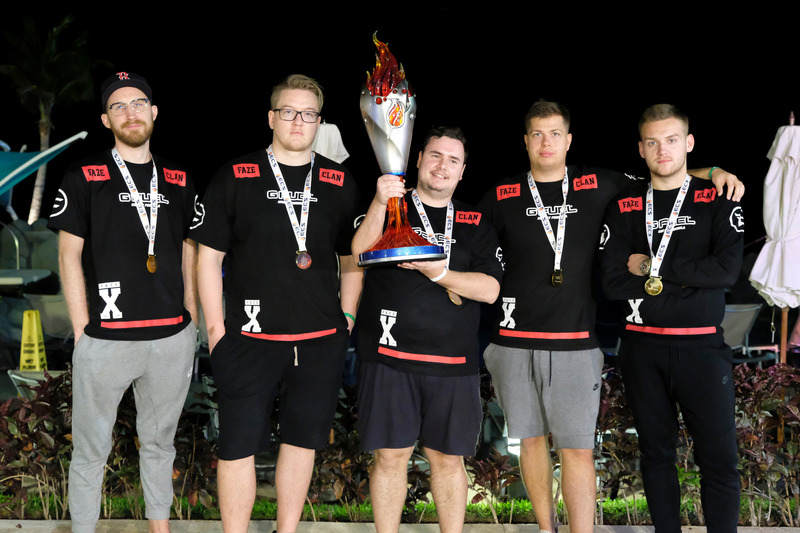 Their success at the top relies heavily on the leadership of Danish in-game leader Finn “karrigan” Andersen, whose tactical prowess is seen both in the map veto phase and in the server. The North Americans’ runner-up position in these rankings bears heavily on their performance at the Boston Major in January. They had the hardest possible bracket—against G2 Esports, SK Gaming, FaZe Clan—and upset a choking FaZe in what is possibly the most intense final map of a Major final, ending in double overtime 22-19 on Inferno. Outside of the Major, C9 have been able to survive the group stage in three of their last five events. Unfortunately for them, they’re a strong team based almost entirely on momentum, meaning that two pistol round losses could potentially put them out of a map for good. Mouz have earned their spot closer to the top thanks to their surprising form in past months, which could be accredited to the leadership of Chris “chrisJ” de Jong over his younger stars. Their team mold and roles are very well-defined and developed, with Robin “ropz” Kool and Miikka “suNny” Kemppi upholding much of the team weight during games. Mouz’s ability to put up a good fight against many stronger teams, such as FaZe, makes them a tough contender to face in the later stages of tournaments. Since Keith “NAF” Markovic replaced Josh “jdm” Marzano on the active Liquid lineup, the team has walked out of the shadow of Cloud9, their domestic rival. Moving away from the traditional AWP meta and into the multi-AWPer meta was the best outcome from attaining NAF. With in-game leader Nicholas “nitr0” Cannella taking charge in both the AWPing and fragging departments, Liquid is poised to remain towards the highest tier of CS:GO because of their dynamic, on-the-fly playstyle. Despite their eight championship wins in 2017, SK sit at the midpoint in this ranking set because they’re in a slump—plain and simple. They ended their 2017 on a high note with a win at the EPL Finals, but they couldn’t keep up their stride heading into the new year. They were eliminated in the group stage of IEM Katowice and the ongoing WESG World Finals, and even captain Gabriel “FalleN” Toledo is disappointed in the team, signaling the alarms for panicked Brazilian fans. Fnatic became the most successful team in Katowice event history recently, as they upset FaZe in a best-of-five at IEM Katowice. With the refreshing leadership of Maikhail “golden” Selim paving the way to victory for the Swedish veterans, Fnatic in their current form are displaying a classic playstyle that fits the current meta while also showing off nuances of their successful 2015 roots. Robin “flusha” Rönnquist and Jonas “Lekr0” Olofsson have been top performers for Fnatic lately, and their persistence to perform in international tournaments could help the team climb the rankings in the near future. The formula for a winning Na’Vi is simple—literally. Oleksandr “s1mple” Kostyliev is absolutely the backbone of this CIS-region squad, and without him, there is no Na’Vi. If he isn’t enabled to perform to the best of his ability or if he is having a bad game, then Na’Vi are going to have a bad time. Occasionally, Denis “electronic” Sharipov and Egor “flamie” Vasilyev will put up good numbers, but the lack of a fragging presence is what truly hurts Na’Vi from unlocking their on-paper capabilities. Since Markus Kjaerbye left Astralis in favor of its regional rival North, Astralis seem to be in a progressive state of improvement with newcomer Emil “Magisk” Reif. Kjaerbye was a huge part of the same Astralis lineup that won the ELEAGUE Atlanta Major in January 2016, but Magisk seems like the perfect fit to replace him. Additionally, Nicolai “dev1ce” Reedtz is back in the flow of AWPing after his medical hiatus, which resulted in Peter “dupreeh” Rothmann filling the AWP role for a few months. Those changes have since been rescinded, and Astralis will eventually flourish once again when they completely unlock Magisk’s star power. NiP’s placement in these rankings is based on their win at IEM Oakland last November and their high placing at IEM Katowice. After finishing last at cs_summit 2, Richard “Xizt” Landstrom stepped down to make way for former Fnatic veteran Dennis Edman, whose pistol round capabilities are highly regarded. Glimmers of NiP magic could be seen in Katowice for the first time in months, and NiP looked like an entirely different team prior to Xizt’s move to the bench. The Frenchmen of G2 aren’t in their same “super team” stature that won the EPL S5 Finals and DreamHack Masters Malmö. Their recent LAN and online results, like in Season Seven EPL, are abysmal when compared to what they accomplished in 2017. G2’s current form culminated into a change for the CS:GO lineup, including the removal of Richard “shox” Papillon for Oscar “mixwell” Canellas. Now Nathan “NBK” Schmitt is in-game leading, and G2 may need a period of experimenting to see how they’ll perform without shox’s instrumental shotcalling.